We would like to formally welcome you to Oakmont Apartment Homes, Catoosa, Oklahoma’s premier apartment community. Located just off Interstate 44 and Highway 167, Oakmont Apartment Homes boasts beautiful apartment homes that were designed with your style and comfort in mind. We offer a selection of one, two, and three bedroom floor plans. Our apartment homes come fully equipped with luxury features such as a spacious gourmet kitchen, a full size washer and dryer, and even elegant vaulted ceilings in select homes. If staying within the confines of your apartment doesn’t suit your needs, relax beside our resort-style pool, meet new friends in our resident clubhouse, or stick to your fitness goals in our 24-hour fitness facility complete with audio and video equipment. Experience the luxury, maintenance-free lifestyle you deserve at Oakmont Apartment Homes today! 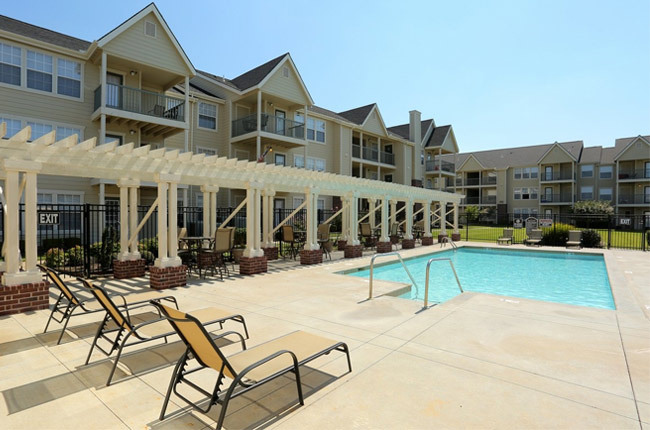 Located south of Interstate 44, Oakmont Apartment Homes boasts a central location in the heart of Catoosa, Oklahoma. We feature close proximity to Route 66, often referred to as the Main Street of America, which hosts a number of attractions throughout eight U.S. states. If traveling isn’t your cup of tea, residents will delight in nearby Woodland Hills Mall where you will find retailers such as the Apple Store, J. Crew, Forever 21, and Dillard’s complete with a MAC Cosmetics. If shopping isn’t your speed, Cinemark Movies 8 sits across the street so moviegoers can enjoy the latest Hollywood blockbuster. Looking for a meal after a day of shopping or movie going? A number of restaurants populate the area, featuring every type of cuisine from mouthwatering surf ‘n’ turf to authentic Mexican. It cannot get much better than our central location at Oakmont Apartment Homes!